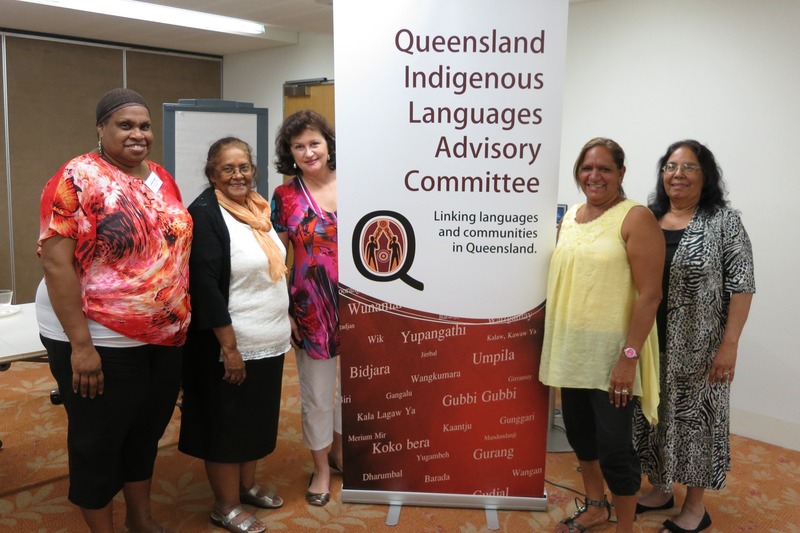 The Queensland Indigenous Languages Advisory Committee (QILAC) was formed in 2005 by Language Centre representatives and other Language workers, in recognition of the need for a state-wide body to advocate for Indigenous languages. QILAC was the prime consultation group for the development of the State Library of Queensland’s Indigenous Languages Strategy, and is working with Education Queensland to ensure that Indigenous Languages are part of our school curriculum. Assisting in the development of a state language policy/framework. Develop and support the use of protocols and legal frameworks for persons involved with language. advise communities of funding sources that can be accessed for languages. To work cooperatively with other state and national organisations and committees. Support the development of resources. Encourage more language workers, speakers and trainee linguists. Pictured with the new logo on display are QILAC members Leonora Adidi, Bridget Priman, Faith Baisden, Joy Bonner and Melinda Holden. Queensland Indigenous Languages Advisory Committee website has been made available to share information about Aboriginal and Torres Strait Islander Language programs in Queensland, while also having a look at relevant news from interstate and overseas. Please feel contact us, to make your own contribution and let’s see how it grows.